My friend from Ukraine I. Lykov have sent me description of Presidential Standard of Ukraine (published in 1999, adoption date unknown). Square blue flag with yellow emblem, gold fringe. The same flag with golden fringe, without the yellow things near the border and with a dark blue field is shown in Album 2000 for the President at sea. I guess this version is for the President on land, not shown in Album. This previously reported standard was made a long time ago. Many of these flags was made to presidential election. And my friend from Ukraine V.Nerubenko saw it. Now in my site (<www.vexillographia.ru>) I have modernized image (source: post stamp of Ukraine) of real standard. Adopted 29 November 1999. As far as I was aware, the reported presidential standard was square (dark) blue with yellow trident and yellow fring on three sides. Now I can't say that this light blue does not look good, adding (what I believe is) oak leaves along the borders. Just possibly, the dark blue version might be a naval flag while this more elaborated version might be kind of a car flag or otherwise for use on land. However, the UA president already have a naval rank flag in his capacity of commander-in-chief of UA armed forces (bicolour rectangle with dark blue shiled with trident). The Flag (Standard) of the President of Ukraine is a square blue banner with a gold symbol of Volodymyr the Great's State (the Small State Coat of Arms of Ukraine). The banner has a gold ornament along its borders and is decorated with a gold fringe. The staff of the Flag (Standard) of the President of Ukraine is wooden with a round onyx top decorated with an embossed lay-on ornament made of yellow metal. Photos at <www.president.gov.ua/prapor.jpg> and <www.president.gov.ua/311750607.html> (i.e. somewhat different color scheme than above). 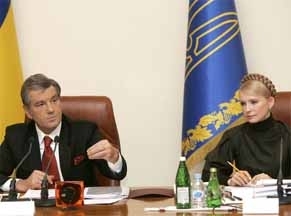 Sometimes president of Ukraine V.Yuschevko uses not official presidential standard with golden trident but enigmatic standard with blue trident fimbriated in gold. See photo from official site of the president. According to L'Album 2000 [pay00] - President of the Republic (on land) (1:1) - Blue square flag with yellow border (these are not fringes!) on three outer edges and yellow trident symbol in the middle. This flag is repsumably used parallel with the light blue flag with yellow leaves (the latter might be used only in special occasions, or it may be a unique standard OSLT). Project of standard of Ukrainian president, The project made by M.Bytinsky in 1930ths. The Coat of Arms in the centre was proposed by him too.